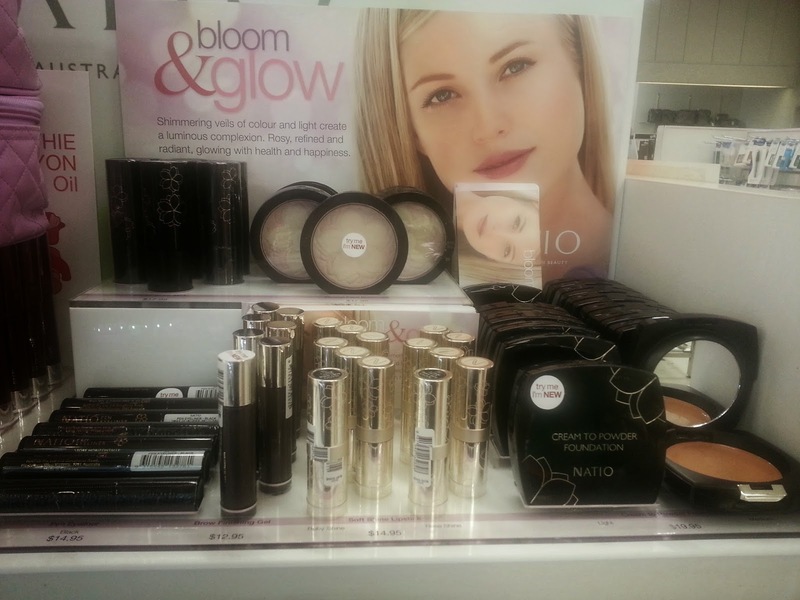 Last week, Natio released their new collection, "Bloom & Glow." I'm a huge fan of Natio's season collections. They always have gorgeous packaging and limited edition colours. "Bloom & Glow" is all about creating a luminous complexion with rosy radiance focused on the cheeks and lips. I was sent 4 products, out of the 7 items available, to review. All of the products are visually beautiful, without the high price tag. Everything is under $20, but is still high quality. This is by far my favourite item out of the range. The packaging is so beautiful. I love the floral design on the packaging. There are 2 lipsticks available. I have "Ruby Shine." The other lipstick is called "Rose Shine" which is a mid pink colour. The colour is perfect for everyone. It's not too pink, not too red or not too dark. When you first apply it, it's quite glossy. It's easy to apply a light wash of colour or build it up. When I've built the colour up, I've never felt like it was too heavy or looked clumpy. It applies onto your lips so smoothly and fool proof. It's incredibly moisturising. After wearing it for a while, the gloss wears off but the colour doesn't. Even after eating, the colour didn't move around and end up all over my face. The colour lightened a little bit, but it was still incredibly vibrant. And I didn't even apply a lip liner!!! It contains argan, jojoba and sweet almond oil to help moisturise your lips. The formula is different from their regular range of lipsticks. I wish they had more colours available with this formula. The added oils make such a difference. These retail for $14.95 each. One of the very first highlighters that I ever used was a powder highlighter from Natio. They re-released it last year (see here) and I've been using it since. I was thrilled that they were releasing another illuminator for this range. This one looks very different as the other one I love is an illuminator and bronzer. I love the bloom detail imprinted. It makes it look so more more luxe than its $17.95 price tag. It contains both ivory and pink, which can be used together or separately. This isn't something that I use everyday, but it's perfect for those days when my skin is looking dull or when I'm using a matte foundation. The Cream To Powder foundation really surprised me. The formula is so soft and creamy. It's easy to apply with the sponge (which is included in the pan) and can be built up. It also has a mirror built in, so it's perfect for travelling or for on the go touch ups. While it sets to a powder, it doesn't dry out your skin or look cakey. When I use this, my skin looks real.... just better. It's perfect for anyone that wants a base to look invisible. If you hate a base that looks like you're wearing make up, then try this out. I don't need to use this with a powder, and yet it still lasts all day. It contains argan and jojoba oil as well as vitamin E.
It retails for $17.95 and is available in "Light" and "Medium." It's a real shame that it's not available in a larger shade range. The last product that I have is the Brow Finishing Gel. For me, I have pale skin and very fair eyebrows (some parts are quite blonde) so I use brow products to give them more definition and volume. This gel only comes in one colour (a natural brown). It has a slight hint of colour that will work on a lot of skintones. For me I found that using this by itself wasn't enough. But when I applied it over an eyebrow pencil it was amazing. Because it's a gel, it sets and helps to tame any unruly eyebrows. It made my eyebrows stay controlled all day. Even though the brush head is quite large, it's very easy to use. There is also a rosey cream blush available (that's in stick form) and a black eyeliner pen available in the range. You can see all of the products online here. Find your local stockist here. PS My local Myer was offering a Natio GWP last week (see here). There's also selected pharmacies offering another Natio GWP (see here), so now's the perfect time to pick up some of the great items from the new collection!! PPS Enter here for your chance to win these!!! I love the look of that lipstick! It's amazing. Not only is the colour beautiful, but so is the formula. It leaves my lips so hydrated. They're both so good. Natio are kings at highlighters. Adoro a cor do batom e amei o duo de sombras, obrigada pela oportunidade.